WE TOOK NOTICE OF THESE MEETINGS IN OUR LOCAL AREA FROM THE FLYER BELOW THAT WAS MAILED TO SEVERAL OF OUR MEMBERS. WE ATTENDED THE MARCH 5TH MEETING - BELOW WE HAVE VIDEO OF THIS MEETING AND ALSO AN EMAIL FROM ONE OF THE FACILITATORS. HOW MANY SUSTAINABLE DEVELOPMENT / GREEN AGENDA EUPHEMISMS CAN YOU FIND? 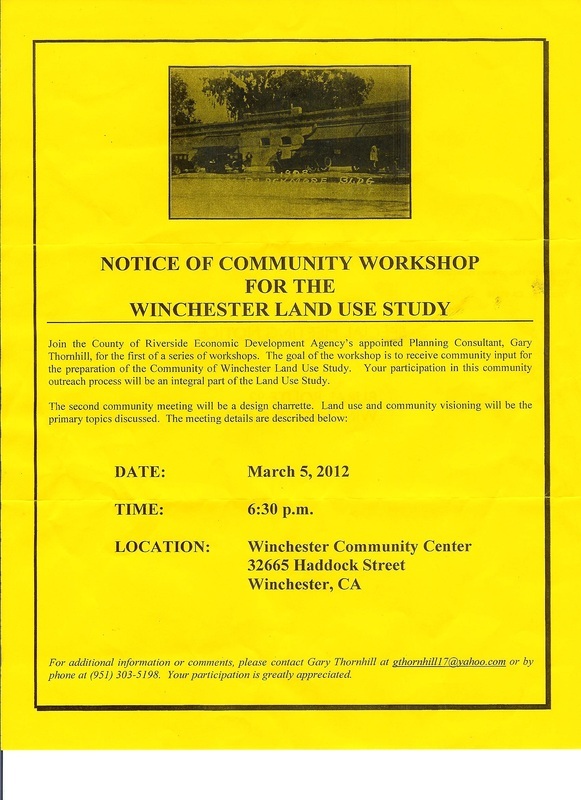 WHO IS THE WINCHESTER HOMEOWNERS ASSOCIATION? Don't you just love it when you get a piece of mail like this that can really affect your personal property and individual rights and you have NO idea who they are? We are still digging on this group - but this is what we have come up with so far. IRS REPORTING ADDRESS: 1045 East Morton Place Hemet Ca 92543 - this is the address of the CPA firm of Pehl, Foutz, Foutz and Teegarden. 2007, 2006, and 2005 Forms 990 filed with the IRS - I have downloaded those files so that you can see them in their entirety - see below. The following descriptions are put into lay terms so that you can understand the ever changing dialogue that the APA (American Planning Association) puts out to entice and mislead the public on their true intentions. We have all looked at a real estate description and know that "quaint" means "small", "cozy" means "even smaller", "rural" means "HOW far out there?". The planning industry, that is full of socialistic ideologues, is no different. OOPS - the public has figured out that "eminent domain" is negative government overreach - so let's now call it "blight". Well, we are on to them and we will continue to call them on the carpet for it. EDA: Government entity that implements the sustainable agenda under the false guise of free markets. WORKSHOPS: Another term for "charrettes" since they are trying to eliminate the word "charrette" in some areas since they have a negative connotation. LAND USE STUDY: Basically - let's study how many environmental groups we are going to have to bow down to. And don't forget all the taxpayer monies that are going to go to pay these consultants to do all this studying. COMMUNITY OUTREACH: Let's invite the public to indoctrinate them with the Delphi Technique. CHARRETTE: Another word for meeting or workshop. These meetings are specifically designed where the deck is stacked with people who want to implement the "sustainable" agenda. They will fill the room of people all on the same page, and then allow a small group of residents to join the workshop - but the verbiage and course of conversation is such that if any of the residents questions or opposes the thoughts of the others - they are singled out and seen as ignorant. They do this intentionally so that no one will speak out, and then they can later say that they held these workshops with the community and the community must want it because no one disagreed. VISIONING: A “stacked deck” of cherry picked individuals in every region who stand to gain financially from Agenda 21 implementation. They falsely encourage the public input, and then proceed to Delphi them. DELPHI TECHNIQUE: This is the technique used in the "charrettes" - basically obliterate all other points of views and questions other than your own to achieve an outcome. Google this term and see how many ways it has been used in the course of history. We have provided a guide so that you can easily read the IRS filings below. It will take just a few moments, so, please, take a few minutes to familiarize yourself with this group. 3 3 3 Describes what they do. 11 13 13 Accounting of monies and reporting amounts of previous filing years. 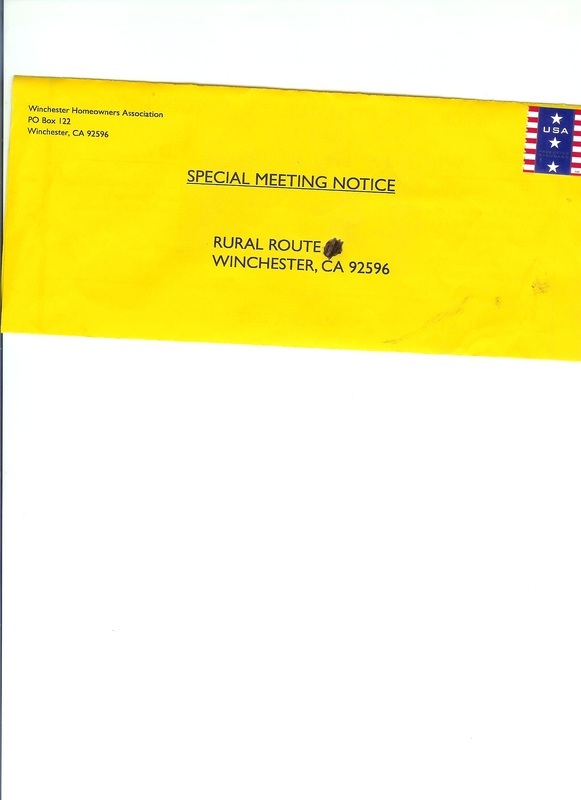 WHAT DOES ALL OF THIS INFORMATION FOR THE WINCHESTER HOA MEAN TO ME? This is not meant to be guilt by association by any means. What this is for, is so that you know exactly who you are working with. They are leading you down a path to make you think that they are partnering with you as a joint venture. If that is a case, then, just like those in the private sector, if you are going to partner up - you want to know who you are working with. You wouldn't partner with an unknown entity and put your trust in them would you? As it is stated in "visioning" - " A “stacked deck” of cherry picked individuals in every region who stand to gain financially from Agenda 21 implementation". You MUST know who you are working with so you know if they stand to gain financially by things that are presented at the meeting. Click HERE to read the Riverside County Integrated Plan as it relates to the Winchester area. It is a rather involved plan. Click HERE to read the "2020 vision" of this plan - unbelievable - you can see how they plan to make way for "community clusters" (socialistic housing) and "habitat" (animals have rights over humans). A member of our group was approached by this individual at the meeting on March 5th and he was abrasive and rude. It was obvious he did not like alternate points of view being expressed. At one point in the meeting when one of us expressed the fact that we did were opposed to commuter trains running through the valley - he scoffed and asked "well how do you expect to get anywhere?" To which the response was "my CAR". Either he has bought into this green agenda and fully supports sustainability - or he doesn't know what it is and he is just there as a mouthpiece. Either way, those of us that DO understand the threat of this, so-called "sustainable", movement and the threats that it poses to our individual and personal property rights, will not be shouted down and will continue to expose it for what it really is. His asinine statement of "how do you expect to get anywhere" says it all. Does he really understand what he was saying? The believers and implementers of this sustainable movement WANT to get you out of your "evil" cars and get you on the train - well, how mobile and free are you when you are on a train that has predetermined stops and you can only go where that takes you at the times the government tells you you can get there. Forget the "Sunday Drive" - you now just have the "commute". SINCE MR. ROWE IS NOT "ASHAMED" OF WHO HE IS, OR HIS POINT OF VIEW, WE ARE PUTTING HIS EMAIL UP IN IT'S ENTIRETY - THE 7 SPELLING AND GRAMMATICAL ERRORS ARE HIS. FACTS ONLY" you say. Well your comments about the planning activities in the Winchester area certainly demonstrate your gross ignorance and misrepresentation of the "facts". I strongly suggest that you become informed of the facts before spreading such misleading inaccurate, defaming information to the public. You really should be more knowledgable before you pick a fight. The next meeting is on March 26th at 6:30. Please attend so we can see who you are and find out what your property interests are in Winchester's future. You now have my full name and email address..How about yours? Or are you assamed to admit who you are? Let's see what is on this website that is "gross ignorance". Hmmmmm, is it the IRS forms? The Secretary of State information provided of who this entity is that Mr. Rowe is a board member of? The flyer from the charrette that they mailed out? Nope, those are all things filled out by this group and filed with government entities or put out by themselves. (These must be the "defaming" items he is referring to). Wait, maybe it is the Riverside County Integrated Plan and the 2020 Vision Plan that we provided the links to over on the right hand column, that you can read in their entirety. Well, if those things aren't it, then the only thing that Mr.. Rowe must be referring to is the definition of the words used because that is all there is left. So, once again, we must ask ourselves - is Mr. Rowe a full believer in sustainable development or does he just not know what these terms mean and what the ramifications are. If you will notice in the video of THIS VERY CHARRETTE- when the definitions are brought up to Mr. Thornhill - he never denies them - he just moves on or agrees with the definition, and the feeble excuse is "well it's already been passed and we are implementing it". In fact, while Mr. Rowe was so rude with us in the charrette - he said it was all in motion and it was going to happen anyway. So now once again - we go back to the very definition of charrette as seen in the column to your right - and we can pick out " that if any of the residents questions or opposes the thoughts of the others - they are singled out and seen as ignorant." OK - so is this sounding familiar to anyone???? The bullying and Delphi technique is hard at work even in the email. I wonder if Mr. Rowe is even aware of what he is doing. It is so pathetic. And if both Thornhill and Rowe are moving this along and telling us (several times, I might add), that all of this is approved and we are just going to have to get used to it - what is the point of the meeting? If you don't want our input - why ask for it? Ohhhh, that's right - it's not the way the UN (via the way of the American Planning Association -APA) has set up the plan. The infrastructure clearly defines that these meetings be held so that the community feels like they have had input, even though the plan is already in place and in motion - it is just a way for the charrette host and their facilitators to get the community used to the idea. No need for re-education camps with bars and locks - we are living it. It isn't just 1 of us - there are many of us. We are not hiding - did you not look at the website? WE HOLD OPEN PUBLIC MEETINGS - names and addresses are here on the website - not very stealth is it? Why don't you come and speak and defend your position? Many of us have been to your meeting and expressed ours. If you were aware of things going on around you civic in nature - then you would know that many of us have gotten up at different city councils, board meetings and civic groups in the valley and have voiced our concerns on behalf of our group. Some of us live in Winchester and in the path of socialist destruction - and others come out to support their fellow citizens. This "Winchester Plan" affects us all. This disease of socialism hiding under the guise of "smart growth" and "sustainable development" is festering and breeding everywhere in the United States - with the root of the infection right here in California. Yes, it is unfortunate that we were asleep for so long - but no more. And nothing is a done deal - how many times have they "amended" a general plan? They can amend it right back to a plan of freedom and personal property rights instead of this European failed socialist agenda. It just takes an awake and INFORMED citizenry and some leaders with cojones. I suggest to click HERE and watch this forum - I am sure you will see people you know speaking - and after you watch them say the very things that we are saying - will you write them an email and call them ignorant, uninformed and tell them they are not knowledgeable? We look forward to seeing you at our meeting- please let us know if you intend to come and we will carve out some time in the agenda for you. And we will definitely be at your next charade, oops, I mean charrette.